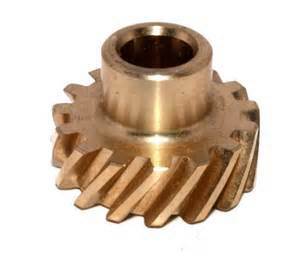 In a Ford, the correct gear mesh is dictated by the height of the boss or pad in the block on which the gear rides. If this pad is worn or incorrectly cast from the factory, extreme gear wear will result. So how do you find the correct gear mesh? Trial and error. With the timing cover removed, use blueing compound to check the gear for a good wear pattern. Check the gear mesh with the gear riding on the pad of the block. 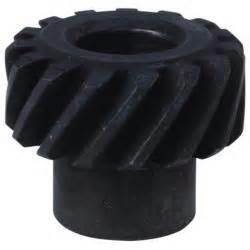 If the pattern is bad, adjust using shims on the bottom of the gear or re-drilling the mounting hole in the gear. Another part that can impact the wear on the distributor gear is the front cam bearing. Make sure it is installed correctly. Some gears appear to have a good wear pattern and still don’t function properly. One cure is to drill a small hole in the lifter galley plug (approximately .040) to spray additional oil on the gear. Contrary to popular opinion, we have not seen any indications that high oil pressure wears out distributor gears on Fords. Nor have we found that changing to another cam helps. 170, 200, 240, 250 2.510 – 2.515 in. 260, 281, 302, 351W, 351C, 400, 424, 460 4.030 – 4.040 in. FE 3.070 – 3.078 in. 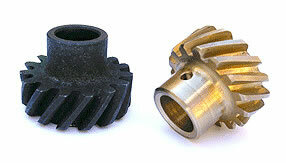 The clearance between distributor gear pad and the bottom of the gear should be .025 – .030 in.